Samuel Roberts, John Roberts, Ambrose Congreve. This note seems to have Ambrose Usher Congreve crossed out as a partner's name. 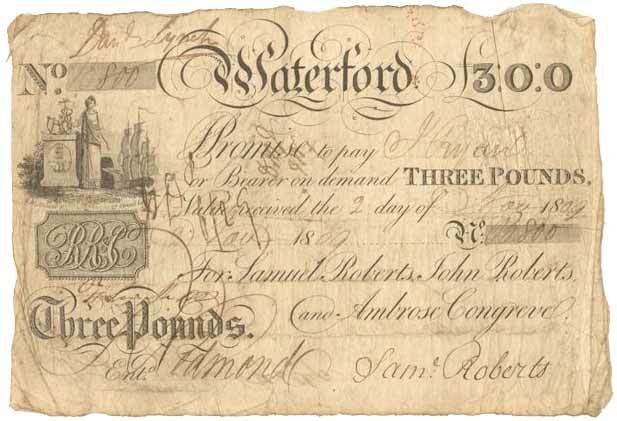 Here's a £3 note, 1809, with Samuel Roberts, John Roberts, Ambrose Congreve. No mention of Ambrose Usher Congreve on this one. There were several banks in Waterford in this era. 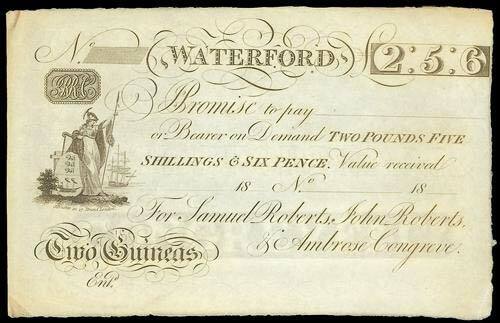 A 2 Guineas note from this bank. 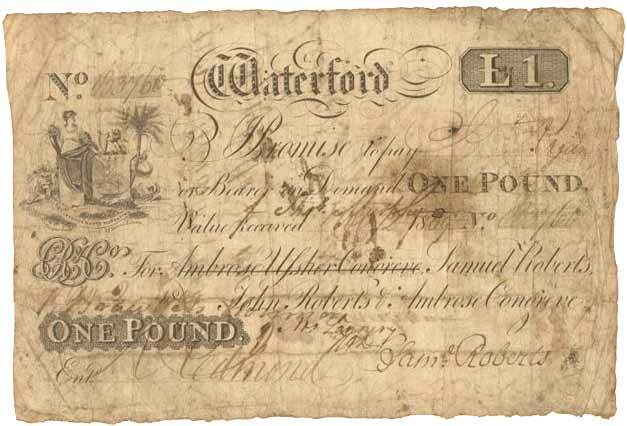 Here is an example of the £1 note with Ambrose Ussher Congreve as lead partner. The serial number is lower than the other example posted where he is crossed out as partner. Last edited by DOC on 07 Aug 2018 23:30, edited 1 time in total. The usage of notes with a partner crossed out is interesting. A sort of overprint to make the notes usable after circumstances changed. It could be regardedas a variety. Interesting to note that there is another variant for the £1 notes with the partners initials missing below the vignette to the left. The section for the date bottom left is also missing. This may be an early specimen. Last edited by DOC on 07 Aug 2018 23:34, edited 1 time in total. Lots of variety for the collector here! Here is yet another variant for the £1 notes, dated 2nd November 1809, with Samuel Roberts as lead partner. Last edited by DOC on 07 Aug 2018 23:37, edited 1 time in total. Here is an example of an issued 1 Guinea note dated 1809 with Samuel Roberts as lead partner. Last edited by DOC on 07 Aug 2018 23:40, edited 1 time in total. Here is an unissued £5 note for this partnership. This is the highest denomination seen to date. The notes of this bank have attractively designed vignettes. The vignette of the £1 note is attached and shown in more detail. There are a number of elements including the Waterford Coat of Arms and City Motto, ‘Urbs Intacta Manet Waterfordia’. This translates as ‘Waterford remains the untaken city’, a motto granted to the city by King Henry VII. (https://en.wikipedia.org/wiki/Waterford). Here is a 30 Shillings note from this partnership dated 2nd Nov.1809.